1. Place the gin, raisins and star anise into a container and allow to infuse for 3 days at room temperature. 2. Pour the infused gin with the sherry and orange wedges into a cocktail shaker, fill to the top with ice cubes. Place the lid on top of the shaker and, holding the top, shake vigorously for 10 seconds. 3. 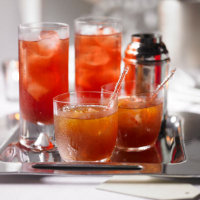 Pour the drink through a fine tea strainer into 6 chilled tumbler glasses. Add a couple of drops of orange blossom to each drink and serve.